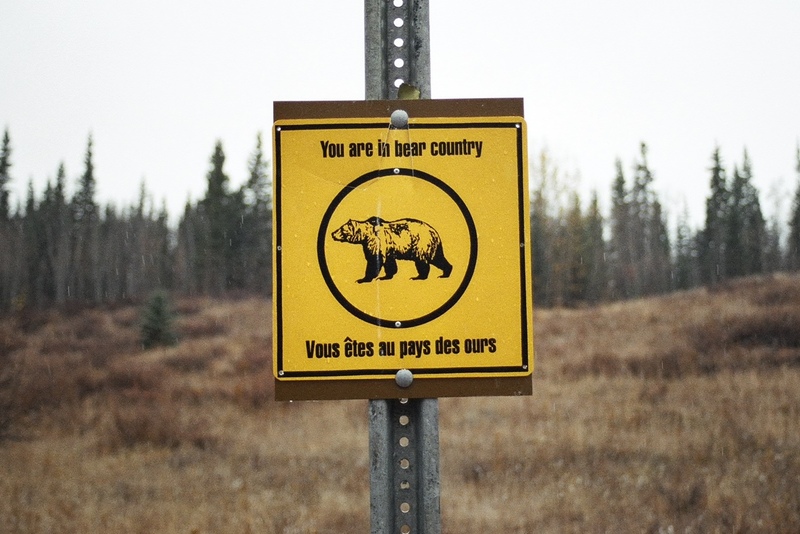 I’m now getting back to the latter part of my Canadian trip in 2004. 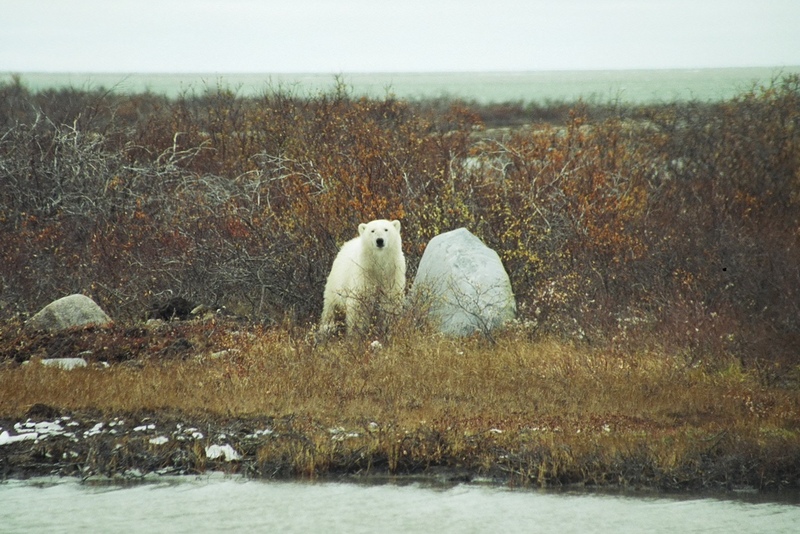 My last post saw me in Churchill, northern Manitoba, a remote place famous for big white bears. And big white bears was my reason for being there. 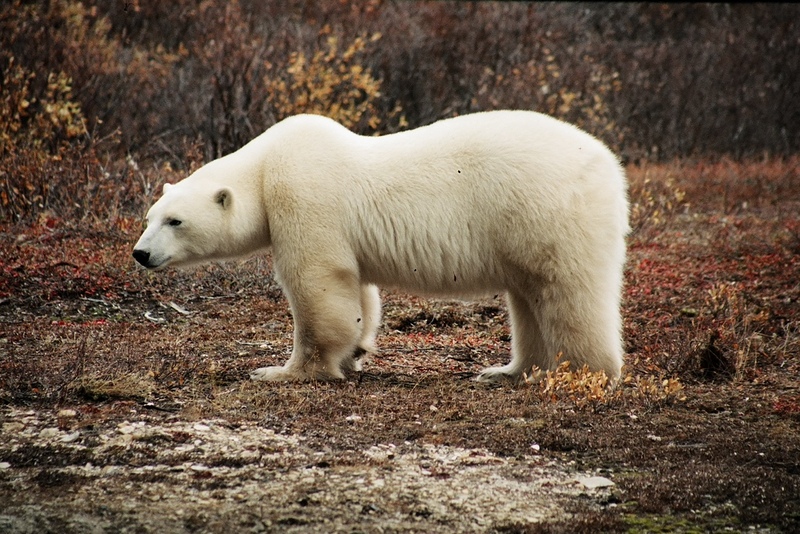 I booked a polar bear tour before I left home and seeing this threatened species in their natural environment was to be one of the highlights of the trip. It was fairly early in the morning when the mini bus picked me up from the b&b. With just eight of us heading out it was a nice small group – I imagine when the season gets cranking these tours are well subscribed. We went out of town 20km or so to the tundra buggy depot where we transferred into one of these odd looking vehicles. It came complete with furnace so we were nice and cosy as we slowly crawled and bumped around the sub-arctic tundra. 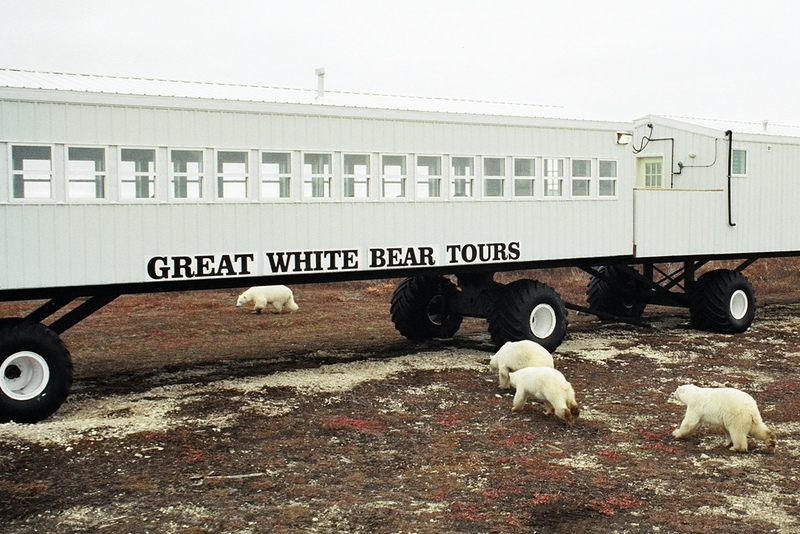 The first stop was near the tour company’s mobile lodge located near a polar bear nesting area. There was to be no getting out of the vehicle on this tour and the buggy was high enough off the ground to be out of reach for inquisitive (or hungry) bears. 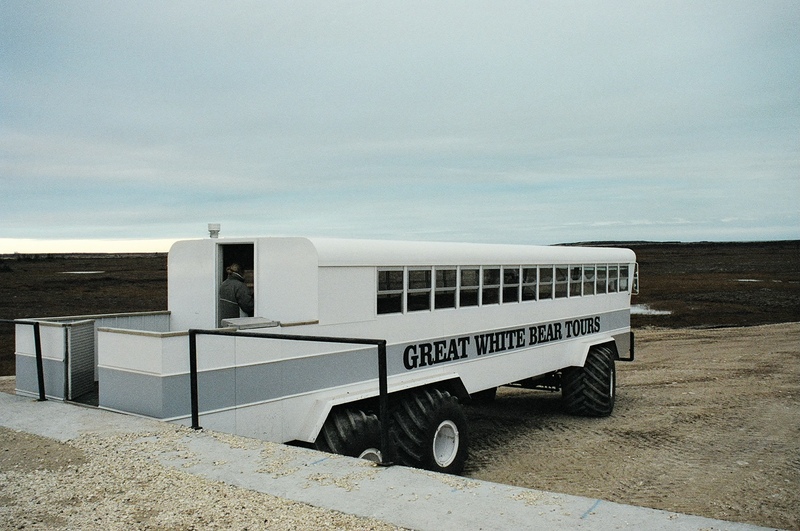 Next to the lodge – which was basically a couple of long rooms on wheels – was a female bear with cubs. We watched them for a long time. Initially they were sleeping, all curled up together, but they eventually started to get a bit restless. The bears are not fed as that would create all sorts of problems, but food smells from the lodge are perhaps inevitable. After sniffing around the lodge for a while, one of the cubs came over to our buggy. He/she was bold, standing on hind legs up to the windows and under the grated platform at the rear. 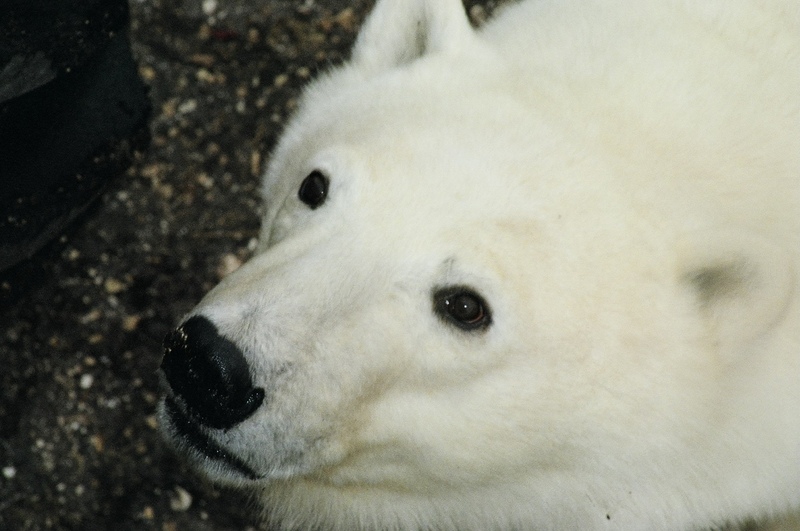 We were thrilled at being able to inspect a polar bear so closely. 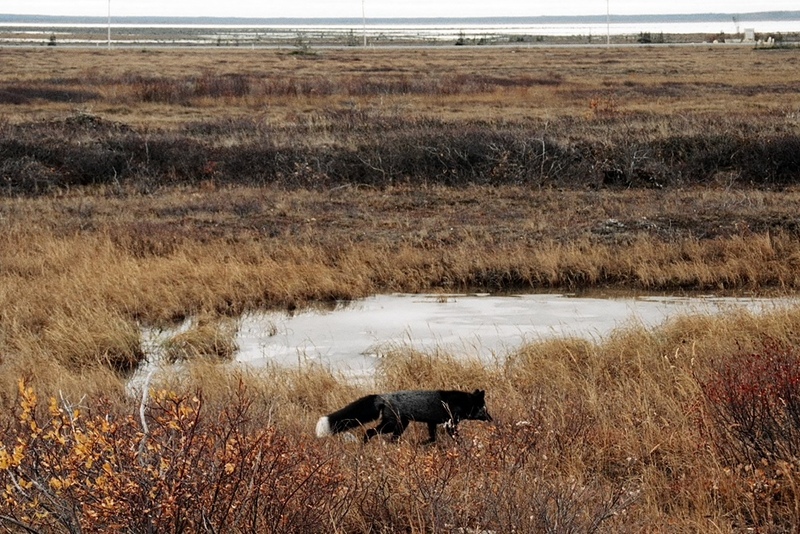 We then saw another female adult bear which had wandered into the area. However, mumma bear wasn’t having a bar of that and chased her away under the lodge. 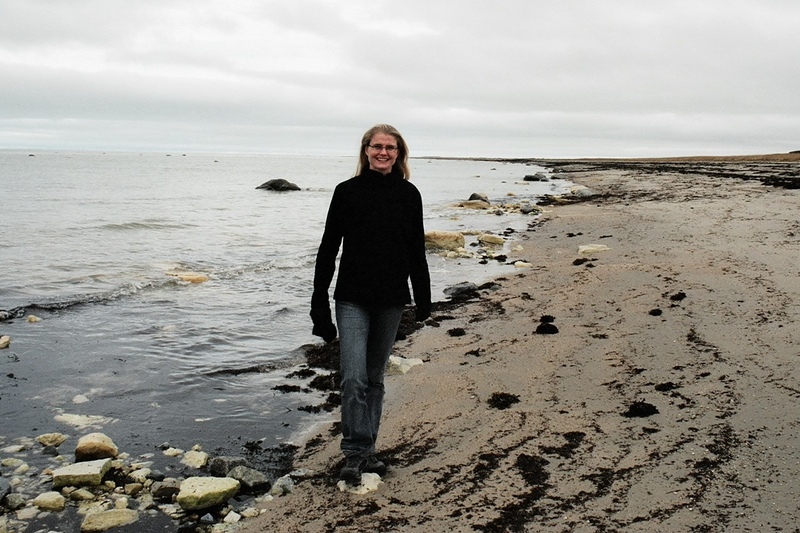 We left the nesting area to drive further afield, stopping for lunch overlooking the coast. Winds from the north made it a bitterly cold day but the furnace was brilliant. 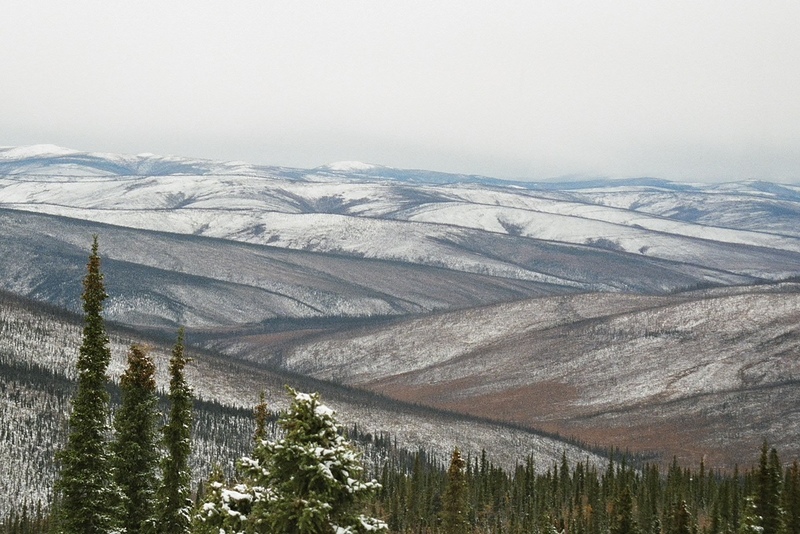 A couple more bear sightings during the afternoon helped round out the day until it was time to head back to base. 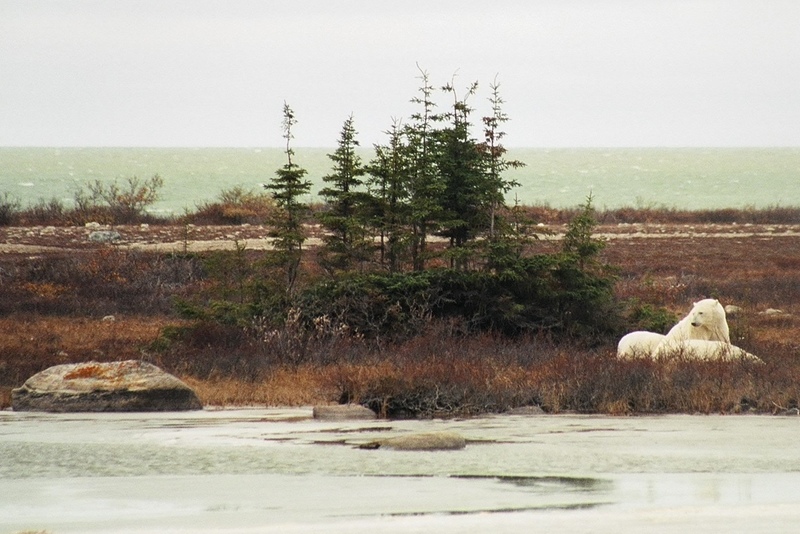 I would love to return to Churchill one day but it is not to be taken for granted that the bears will always be accessible. 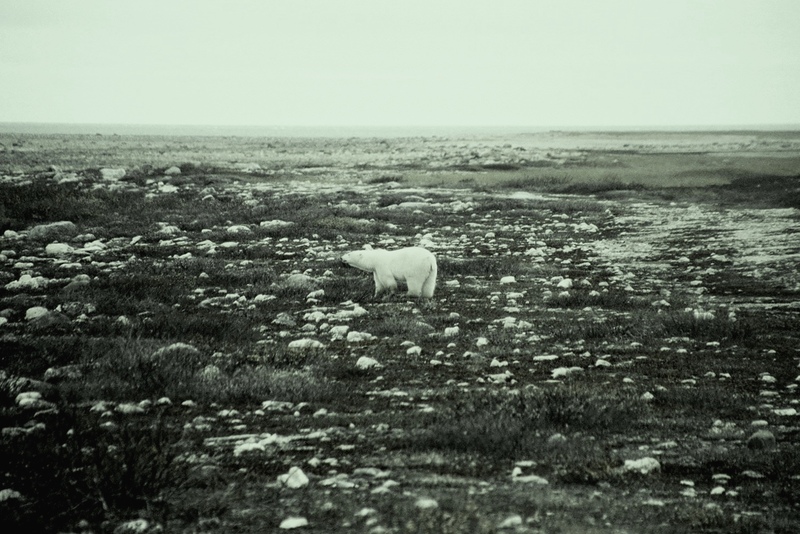 Climate change is slowly reducing the duration and intensity with which the Hudson Bay freezes over each year and this threatens the bear population as they have a shorter period of time in which to hunt. I’m glad I took the chance to see them when I did. 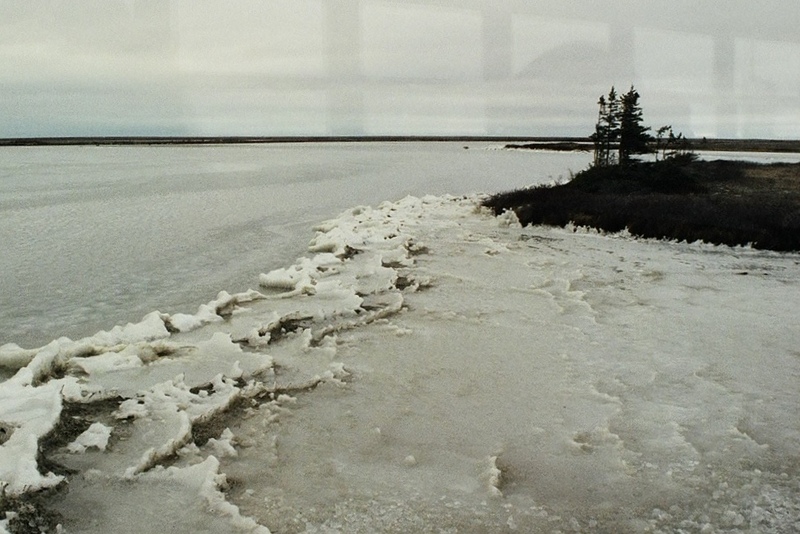 I was in Churchill for 2.5 days so couldn’t dilly dally about. My b&b was in town and being a small place it was easy to cover on foot. Provided I did so during daylight hours and didn’t venture down to the bay. So with these words of caution from my hosts I spent the first afternoon walking around, doing a spot of shopping and looking through the museum. This is the b&b. All of the buildings are built for the unique climate and are mainly wooden and weathered looking. 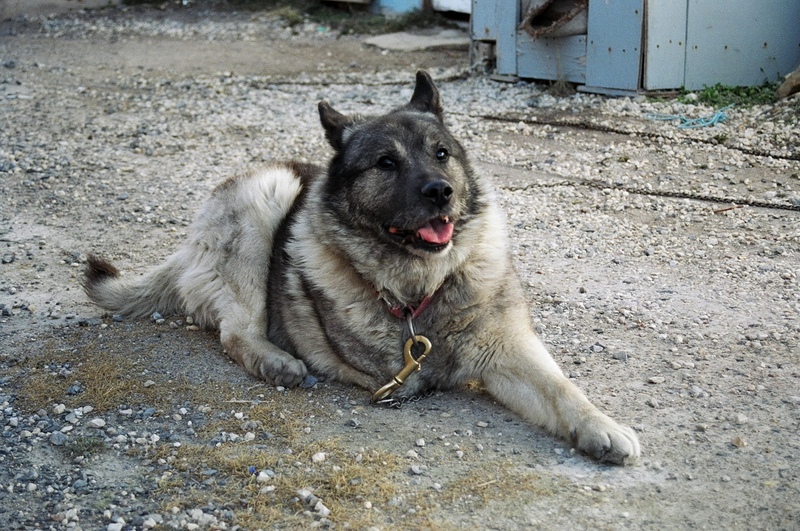 Their scary looking but lovely three-legged dog. It is quite a sparse and barren looking place. 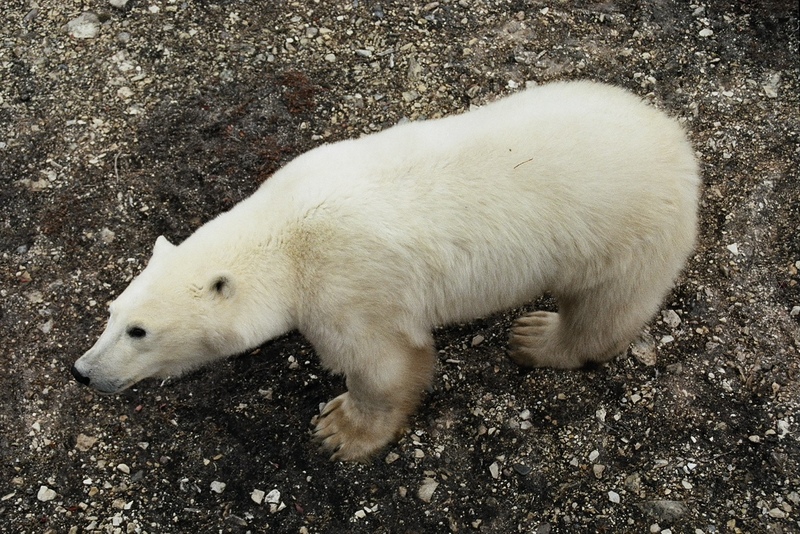 The next day I went on a long-awaited polar bear tour which I’ll cover in a separate post. 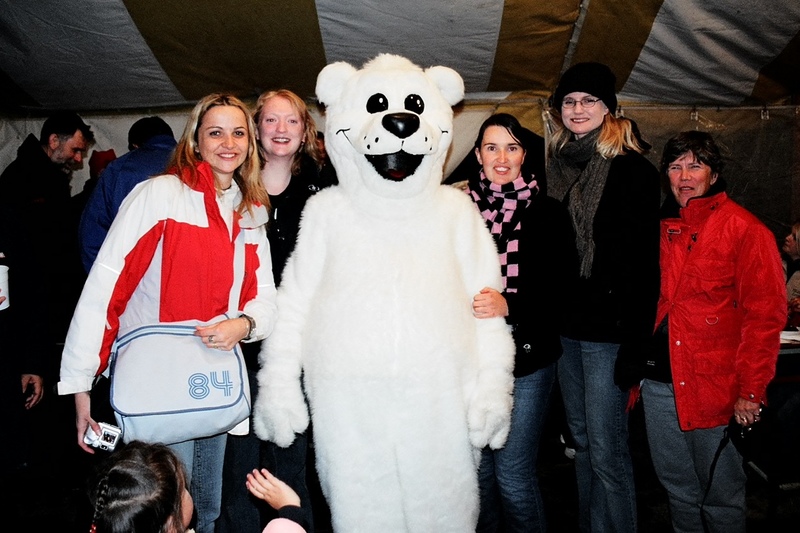 Later that evening I met up with another girl from the tour and a couple of others to go to a ‘polar party’ to mark the start of polar bear season. 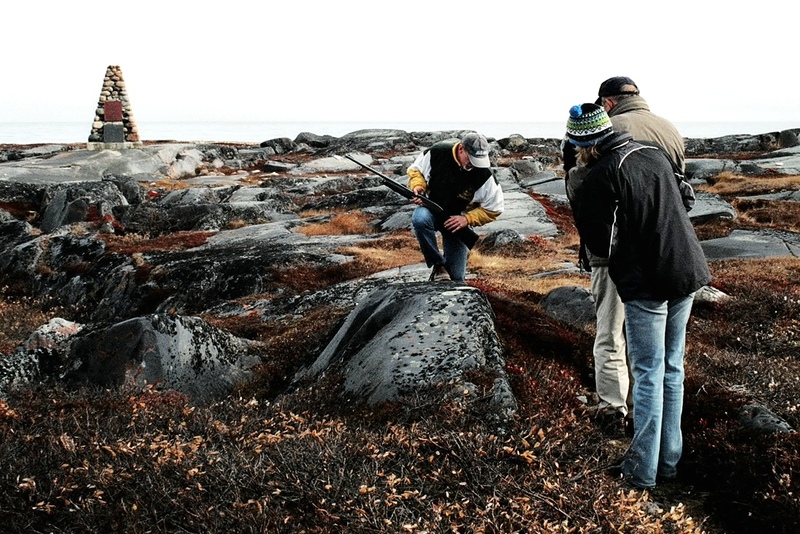 There we got to sample local cuisine such as caribou and musk ox – which is about as crazy as I get when it comes to food experimentation! My departure the following day was not until the evening so plenty of time to fit in another tour. This was around the local sights and was really interesting. 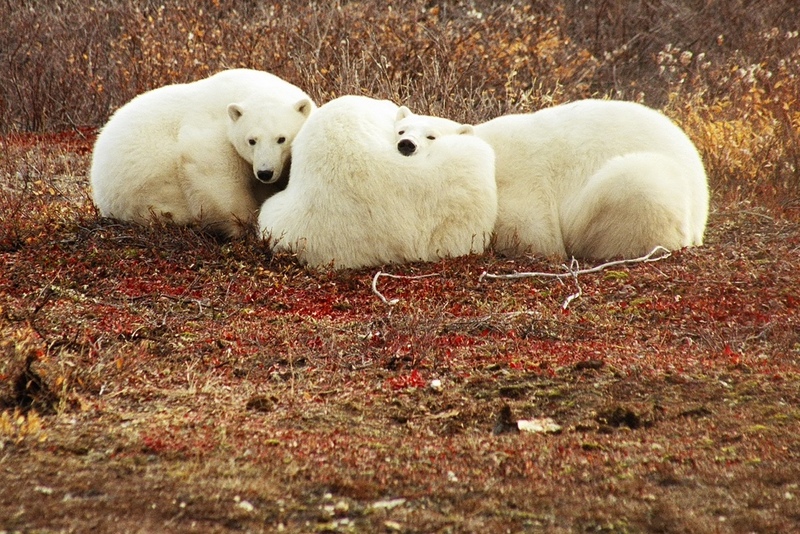 Polar bears are the mainstay pull but is certainly not the only feature. However, their presence did mean our tour guide carried a gun for the parts of the tour where we left the bus. 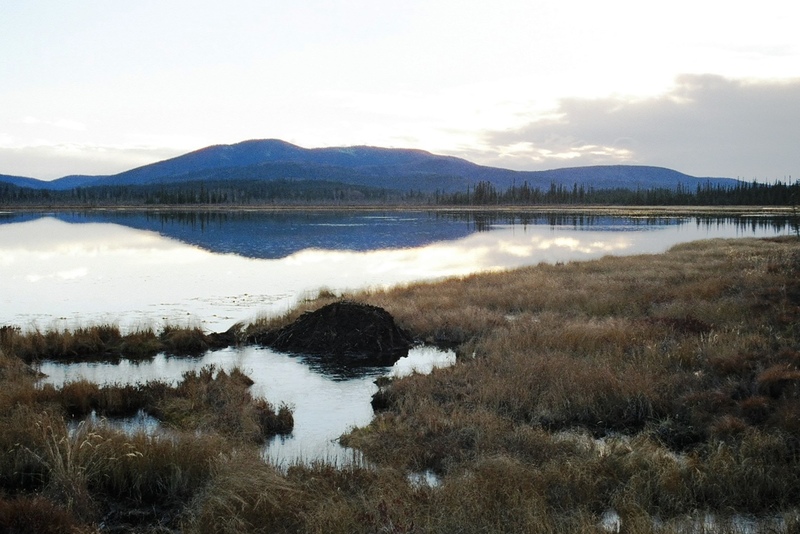 And Churchill isn’t just about nature either – there is a fascinating history from its trading origins and now defunct military base. 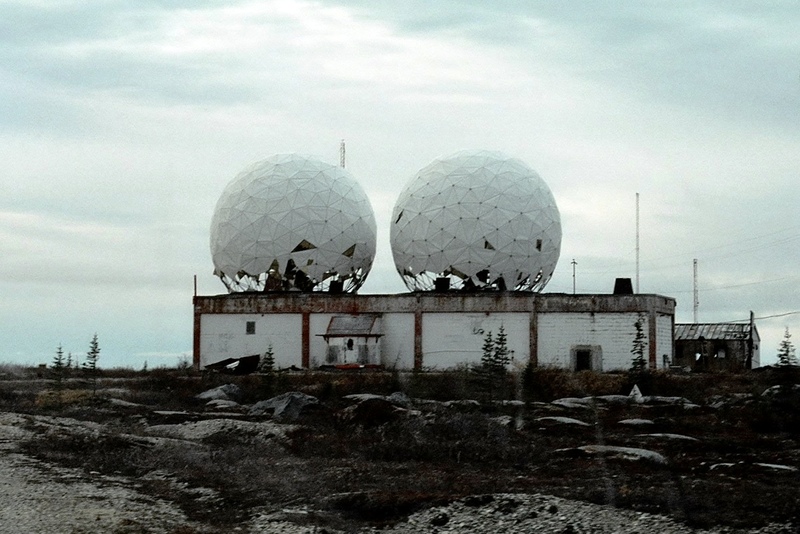 This is an old radar facility. 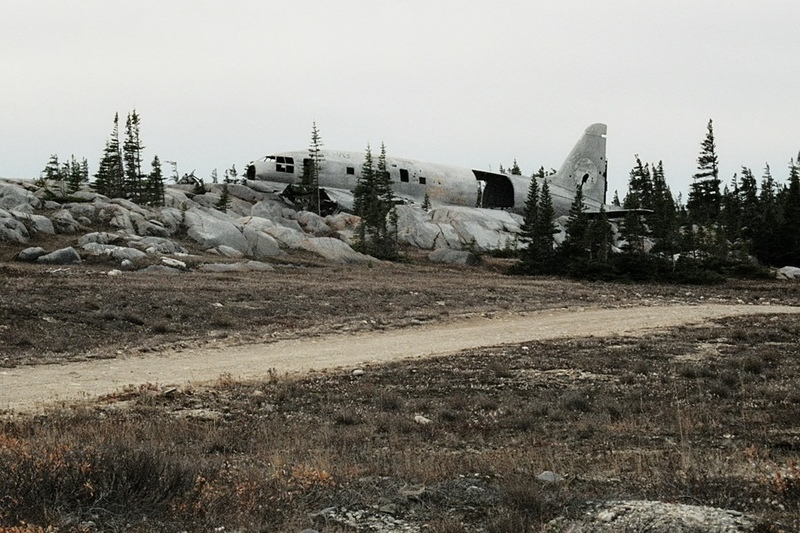 The wreck of a cargo plane which crashed in 1979. 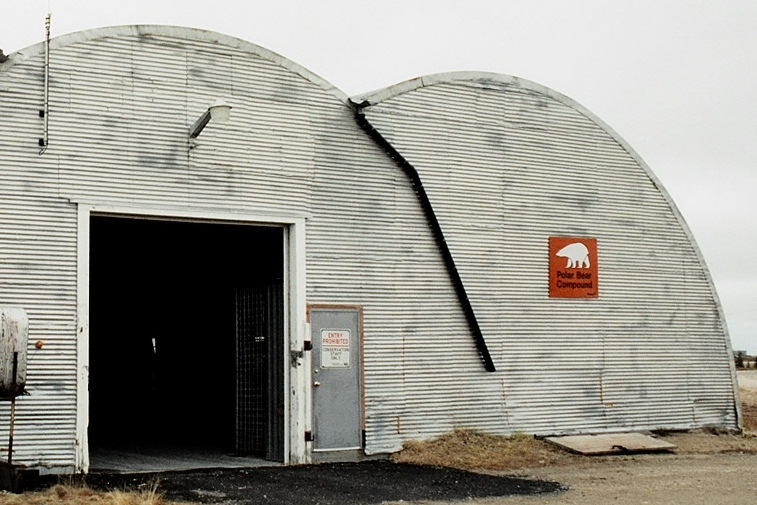 This is a jail of sorts for polar bears. 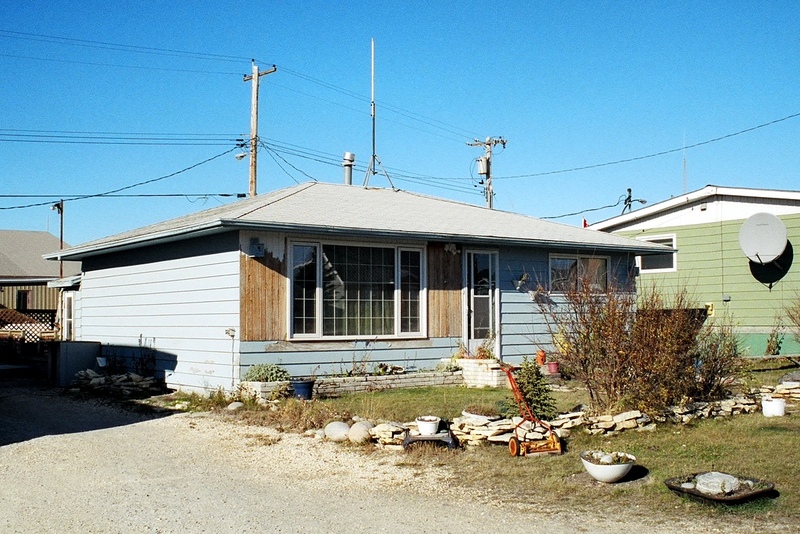 Any that repeatedly venture too close to town are captured and held in this compound until the Hudson Bay freezes and they can be released to find food. A rare sighting of what is apparently a variant of red fox. All in all, not your average small town. 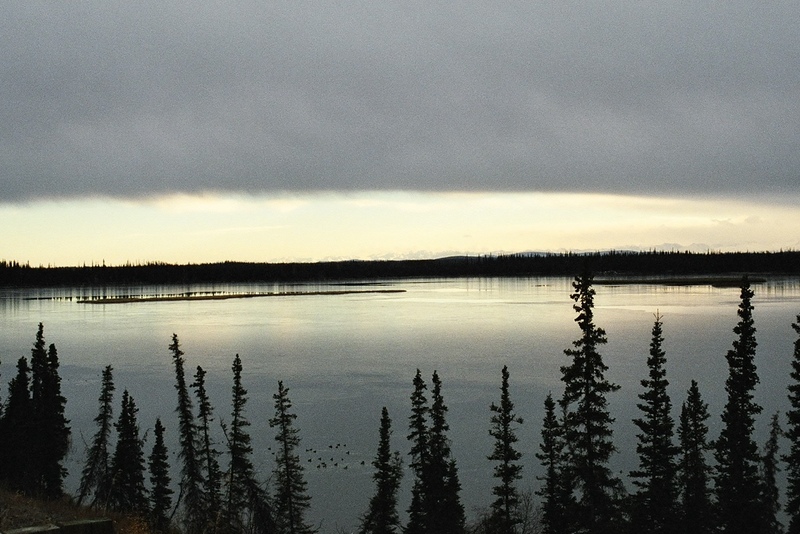 Having reached the end of the Top of the World Highway, we continued through Alaska and its stunning landscapes. 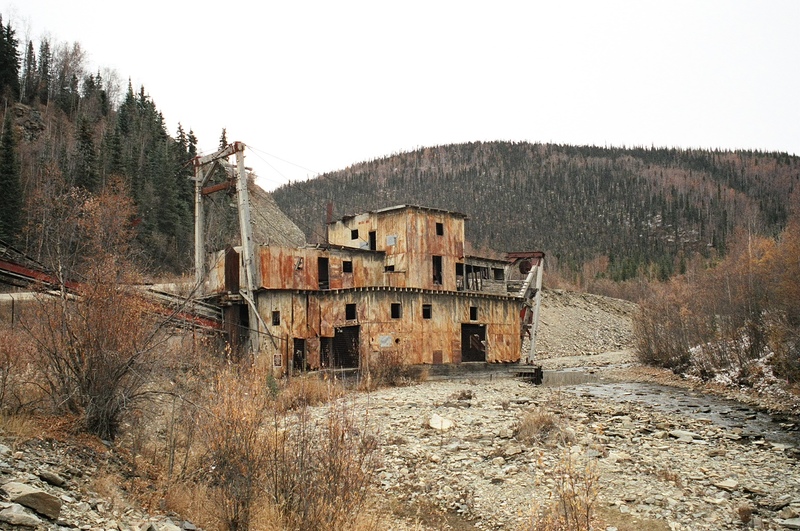 And the occasional evidence of mining operations long past. 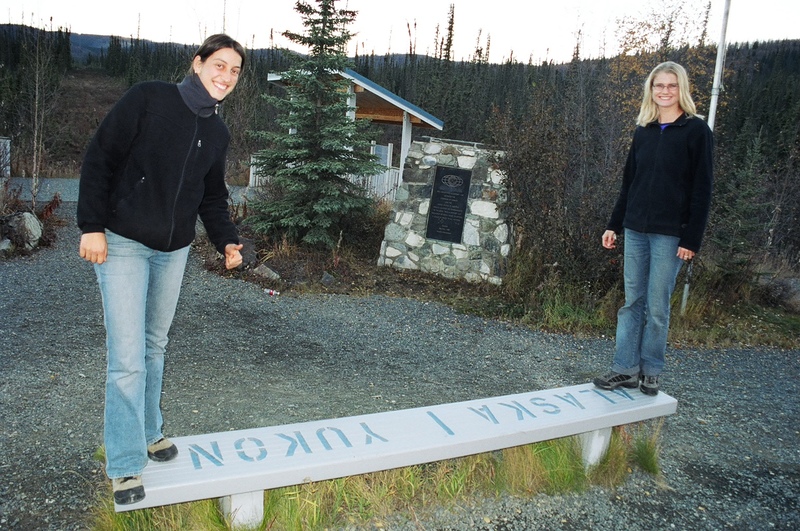 The Taylor Highway started to take us back south, eventually handing us over to the Alaska Highway. We passed lots of waterways. As we transitioned into evening we also transitioned back into Canada, passing through a somewhat bigger border post this time. 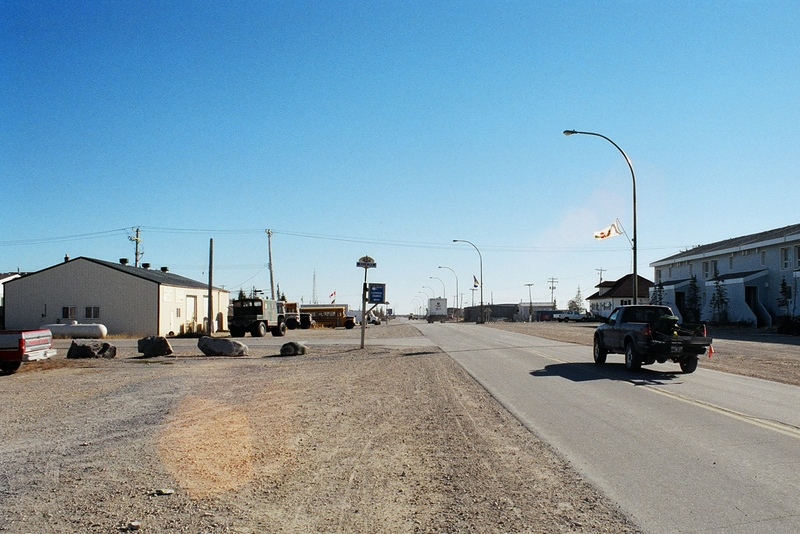 Not far away was Beaver Creek, Canada’s “westernmost community”, and a roadside lodge which allowed us to call it a day. The next morning it was back in the saddle for the final stretch back to Whitehorse. 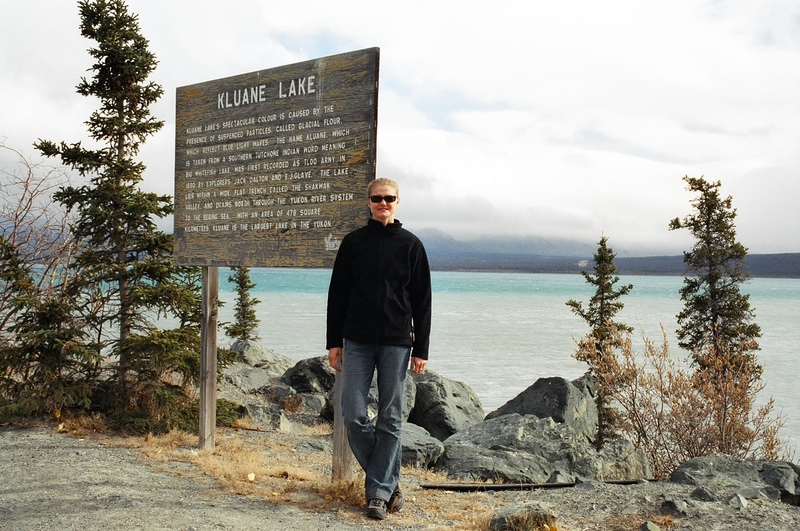 We had a lunch stop beside Kluane Lake. 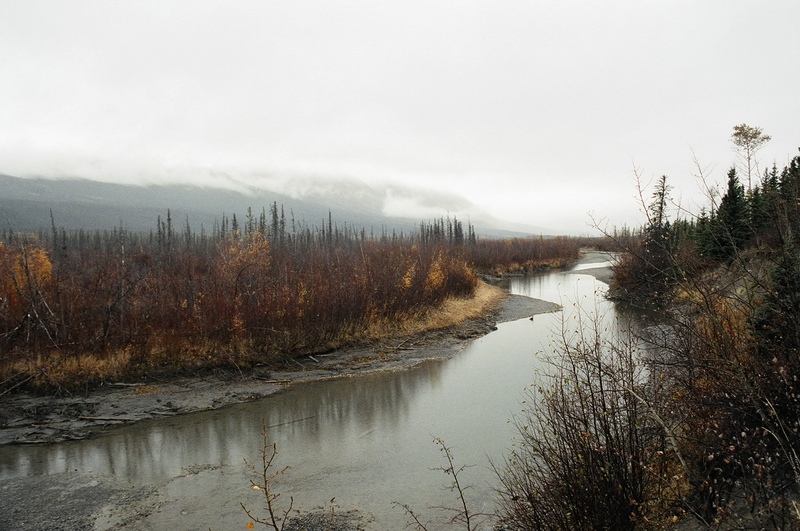 This was near the village of Haines Junction, next to the Kluane National Park. 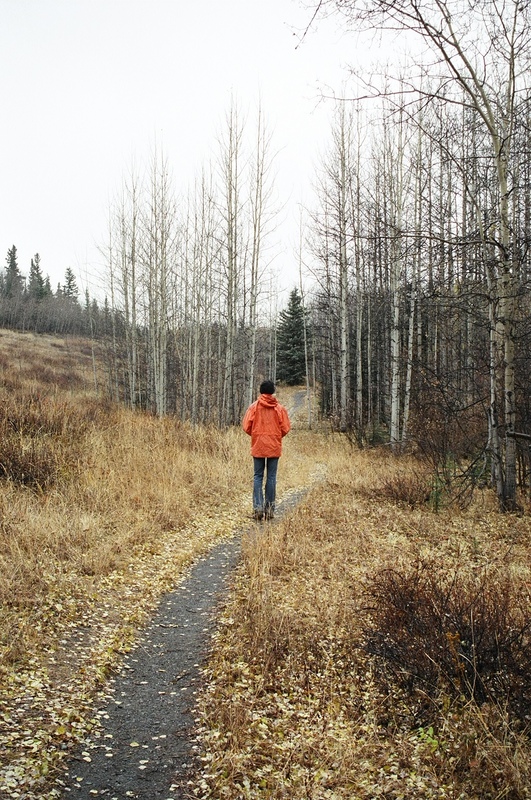 We ventured out in drizzle along a 5km trail beside the Dezadeash River. 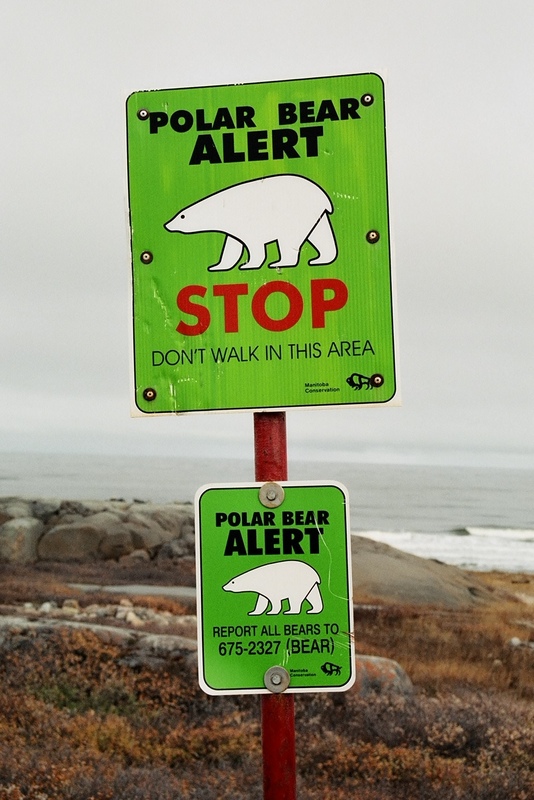 Bears were apparently around, but on this day at least they weren’t lying in wait for juicy tourists. 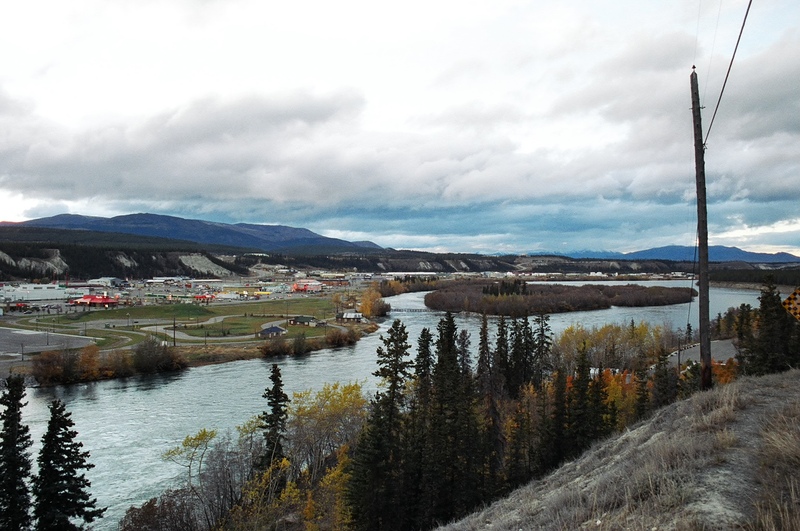 After a few long days on the road we rolled back into Whitehorse, seen here across the Yukon River. But no time to rest, I was heading back to Edmonton the next day. The pace seems rather furious in hindsight, though I have a tendency to do this even now, and my diary makes no mention of travel weariness. So much to see, so little time, and the stamina to do it I guess!